Chewable tablets with powerful antioxidants and joint strength nutrients. Vegetable based beef and bacon flavoring. Also available in a 360 ct and a 6-pack. ZoomDog's ProStaffer Lyle Steinman, long-time user of Hunt Dog Hunt, has won his 7th SRS Crown Championship, with Indy (it's her second win). Lyle uses Hunt Dog Hunt to keep his dogs performing their best and hunting well into their senior years. Try it today! For more info, check our blog post about Lyle's win here. Joint damage can happen in younger dogs. It is more common in older dogs. Sporting & hunting dogs have unique needs. The harder they work, the more free radicals they create. The older they are, the more free radical damage they have accumulated. These dogs need antioxidants more than any other dog. Antioxidants work just like a fire extinguisher, putting out the fire caused in your dog’s joints from free radicals. You can help your dog avoid potential problems from joint damage. Antioxidants are so important to your dog, they are found in every cell of its body. This special class of nutrients is critical for gun dogs and their unique needs. The key difference between ZoomDog's supplements and other joint supplements is their antioxidant content. 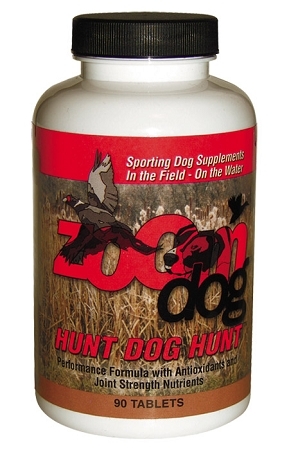 Hunt Dog Hunt Performance Joint Formula has the strongest polyphenol antioxidant known to science. Its been proven to be 20 times stronger than vitamin C and 50 times stronger than vitamin E at eliminating free radicals. 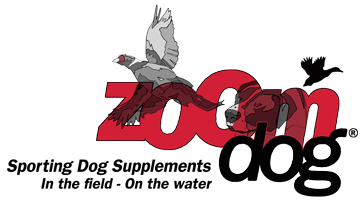 Sporting and gun dogs work harder than other dogs and need the strong antioxidant power in ZoomDog Supplements. Extensive scientific research has shown that this antioxidant reaches the collagen tissue, where it stops free radical damage in its tracks. What is this super antioxidant? It’s a natural plant extract called oligomeric proanthocyanidin. Now that is a real mouthful for most of us, so we call it OPC for short. Not only does Hunt Dog Hunt Performance have this amazing OPC ingredient, it has other important antioxidants. These antioxidants can help promote faster muscle recovery and regeneration after exercise. They help protect your gun dog’s joints from injury and the wear and tear of aging. Cysteine is an essential, sulfur containing amino acid. It is rapidly absorbed and works with another key antioxidant, glutathione to get rid of damaging free radicals. Manganese is an important nutrient for building new joint tissue, and as an antioxidant. It is required to maintain the toughness of the outer cell membrane and build its resistance to attack from free radicals. Vitamin C is another important antioxidant, so important animals make their own. But in really active animals like hunting dogs, some extra vitamin C can help keep their joints healthy. Most joint supplements have manganese and vitamin C, but Hunt Dog Hunt is unique because it adds cysteine, OPC and essential fatty acids, EFAs. No other joint product has all of these important ingredients, included to meet your gun dog’s special needs. As important as antioxidants are, there are other ingredients that help keep joints healthy. Most of us have heard about glucosamine and chondroitin sulfate. They are found together or individually in every joint supplement. But they are not enough. Cartilage is made up of collagen. This is what gives joint cartilage its strength and resilience. Hunt Dog Hunt has hydrolyzed collagen, plus glucosamine and chondroitin sulfate. No other joint supplement includes all three of these key ingredients. In fact, the Hunt Dog Hunt formula was given a U.S. patent because the clinical research proved its combination of ingredients worked faster than other joint supplements. Just like your car’s engine needs oil to run well, your dog’s joints need oil to keep them lubricated and working smoothly. This is what glucosamine does, it keeps your gun dog’s joints well oiled. Hunt Dog Hunt has 600 mg. of glucosamine per tablet, more than the usual 250 to 500 mg. in other joint supplements. Why? Because gun dogs have special needs and require more of this joint lubricant. Chondroitin sulfate provides raw materials for building joint tissue cells, and also helps inhibit destructive enzymes that break down collagen. In one study on 63 dogs with osteoarthritis, pain scores were recorded for four common activities: walking, getting in/out of a car, walking on an incline, and squatting to defecate. Hey, don’t laugh - just think how you would feel if it hurt to squat and you had to do it everyday? As you can see from the graph, the pain scores dropped in every category. 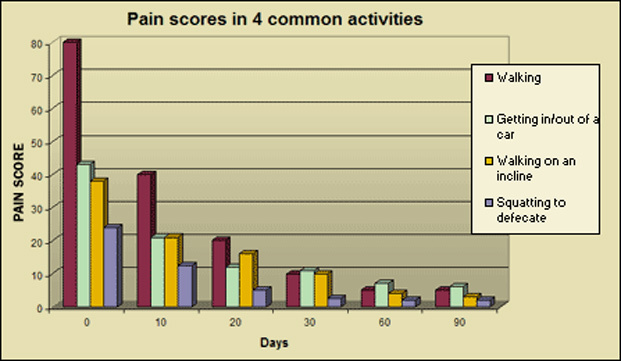 Most exciting is after just 10 days of use, there was a 50% lower pain score. And when our dogs are stiff and hurting, we want them to feel better faster. By the end of the clinical trial, 93.7% of the dogs showed improvement, and none of them got worse. Should I use Hunt Dog Hunt or ZoomDog Soft Chews ? Abbie is going on 10 years old. A few years back she tore her ACL and we were told she would need surgery. Opting not to have that done (heard good and bad views on the surgery) we decided to try the zoom dog hunt formula and water therapy (in our ponds) and she is doing great. Word of caution for dog owners, DO NOT let your dogs play catch or fetch on the ice, that is the way our dog got hurt and have been advised the same by our vet. So all in all I would recommend this product, worth every penny! We started using Hunt Dog Hunt when our English Pointer was 6 just as a preventative measure. She hunted up to the day she died at 13 and if it wasn't for cancer she'd still be hunting. She could hunt all day and outlast our 6 yr old Llewellin Setter and everyone else's dogs that we hunt with. Our setter is now 8 and has arthritis in her hind legs. We started using this and it's helped a lot. This is a great product and we have gotten a lot of other people to use it. We plan on giving it to our 1yr old English Pointer when she's 6 as a preventative, too. Thanks.